A womb-like feel can calm your infant to help them (and you) get more sleep. Swaddling provides this feeling to soothe fussy babies and help parents begin to set initial sleep schedules for their infant. Swaddling also helps to relax the “startle” or moro reflex to keep babies peacefully asleep. This happens in newborns and causes them to spread their arms uncontrollably, often waking them from deep sleep. As an extension of our safe sleep products, our new adjustable Swaddle Trios and Active Swaddle blankets for babies help newborns stay comfortable and safe while parents get to know their bundle of joy. Our Active Swaddle blankets for babies were inspired by stretchy, soft, yoga pant materials — built to last through a busy day. This super-soft, moisture-wicking fabric makes our active, multi-use swaddles the best swaddle blanket for keeping your baby dry all day long. While the womb-like compression helps your baby remain comfortable and calm when swaddled. Our swaddles give moms and dads a little more! 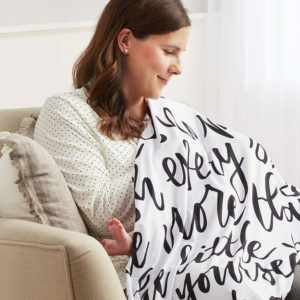 The 95% polyester, 5% cotton fabric allows for easy care while the swaddle blanket itself can double as an on-the-go nursing cover or late night tummy time blanket! You may notice what works for your friend’s or sister’s child may not always work for yours. At BreathableBaby, we set out to give you options as you learn what works best for your baby. Our 3-in-1 Swaddle Trios provide three ways for your child to sleep — arms up, arms down, or arms out! Hands up by their face — to mimic their position in the womb. Arms down by their sides — to catch the moro reflex before it startles your baby awake. 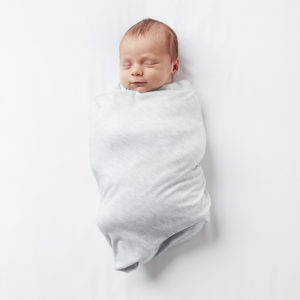 Arms out of the swaddle — to prepare your baby for the upcoming transition away from swaddling. Our adjustable Swaddle Trios were created with an extra wide, hip-healthy bottom area to prevent hip dysplasia issues that can occur when babies’ legs are forced to be straight for too long. They also have an easy-access bottom opening to help baby stay cool on hotter days — plus they make diaper changes a little easier on mom and dad! Parenthood is quite the exhausting and awe-inspiring journey. One day you may have just sat down (likely for the first time all day) when the faint crying comes over the monitor. Other days you could witness your child’s (and your) little victories like the first time your baby sleeps through the night, or rolls over on their own. For those days and all the days inbetween a little motivation from others who’ve been there can make the journey that much more doable. That’s what our momspiration swaddles are all about! Show your wife, sister, niece or whomever is expecting a new member of their family that they’re not alone and they’ve got this! Shop all of our swaddle sets for babies to help parents and newborns get a better, safer night’s sleep in those first few precious months.